I got about 20 miles out when it started to rain, so I turned around just as the small shower passed. This is high desert and we get some snow but very little rain. I was near home and wanted to do some more miles, so I headed up into the mountains. 8 miles with 1800'elevation gain.I worked hard and reached the top just as it got completely dark. 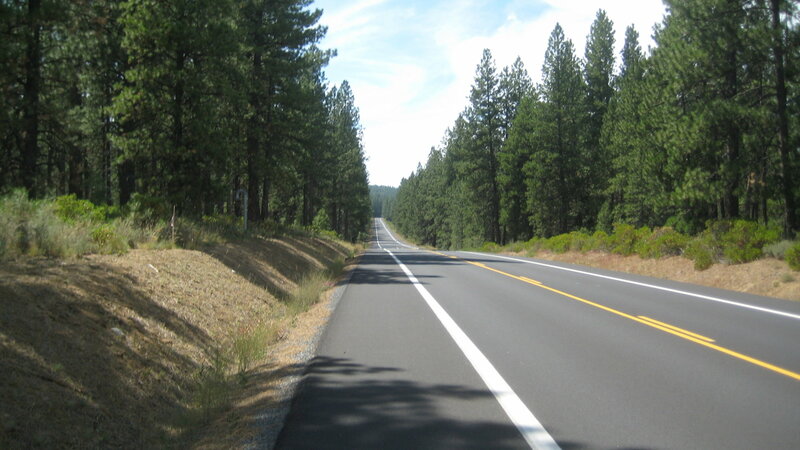 the road is new, mostly straight with a perfect smooth surface. I turned my light to it's highest setting, 1500 lumens and headed home. That late there is no traffic so I took the whole lane peddling as fast as I could. I could see over 200' ahead of me, but none of the trees that line the road. It was a very fast decent, like riding through a tunnel. 59 miles Here is a picture of the road in the daylight. Picture of the road in the daylight. Looking downhill. Last edited by John00; 10-26-18 at 02:54 AM.